Alexandre Billard has managed to find a place in the world of the night by the simple desire to give pleasure and to make the crowds dance. It is thanks to the brand Aston's Night Wear that this young man from Lyon started to live his passion on an international level. Upon his return in Europe, he djed in the most prestigious clubs such as The Baroque (Geneva), the Matignon (Paris) or the Vip Room (Paris, Saint-Tropez and Cannes). Proving himself to his peers (David Guetta, Black Eyed Peas, Usher, Bob Sinclar, Rihanna ...), amongst all odds he succeeded and became the official DJ of Jean-Roch world tour. 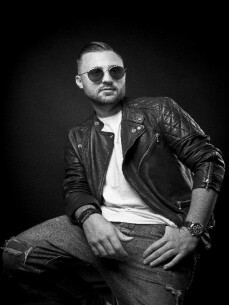 His singles: "Love is the solution", "Don’t you Know", "Look Inside" are quite successful, were broadcasted on national radio and television and are included on NRJ compilations. Being a musical globetrotter, he established his turntables in many clubs such as Movida-Dubai, Bliss-Saint-Martin, Vita Baoli-Miami, Caves-Courchevel, Imperia Lounge-Moscow, Wisky Mist-London, the Vendome-Paris Club, Sin City-Sofia and many more ... leaving behind his style, his personal touch and especially his energy on the dancefloors of capital cities! His musical universe allows him to be spotted and to collaborate with the LVMH group during the fashion shows Louis Vuitton and Christian Dior. He also began a great adventure with the prestigious Maison Chopard, including mixing for private parties and also as an official DJ at the Cannes Film Festival during the 65th edition and until 2016. Among the many projects of Alexandre, we can list the release of a single "Live your Life", an international tour (Bali, Gabon, Spain), a compilation for the brand The Skulls, the World Cup Football in Rio de Janeiro and a long-standing collaboration with the Partouche Group. Today, the excellent sound design of Alexandre Billard enables him to be present in different worlds such as sports, luxury or festivals and clubs. Whether the music is commercial, hip-hop or underground, it’s essentially Alexandre’s house music vibe that draws us all to his sound.